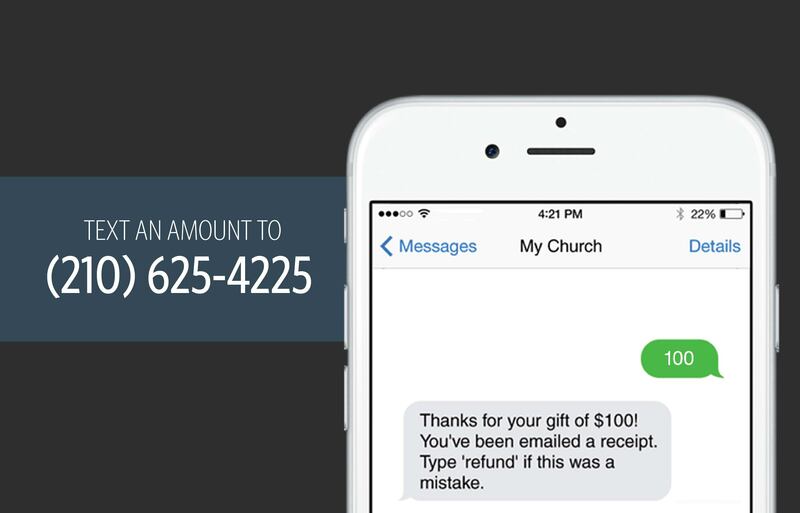 There are great benefits to online giving for both you and our church. . . Helping RockPoint – Online giving is more cost effective for our church to process, and it makes our record keeping much easier. We also offer text giving as a simple, quick, and effecient way to give anytime using your mobile device. There are no extra fees involved and you can choose to give using your debit card, credit card, or bank account (using your routing and account number from a check). The first time you give using the text option, you will be asked to enter your contact info and email so your identity can be verified. You will only have to do this once. You can text "give" and an amount (ex: 100) to (210) 625-4225...or simply text the amount you wish to give. From there, just follow the prompts on your mobile device! Be sure to save the number (210-625-4225) in your phone as "RockPoint Giving." Automated Bank Debit is the easiest and most effective way to automate your giving. Once it is set up, you may update or change your giving at any time by simply contacting the RockPoint office or our finance team at giving@gotorockpoint.com. Plus, 100% of your gift goes to the ministries of RockPoint because there are no processing fees. To sign-up, complete an auto-debit form and mail the completed form to the RockPoint office to have your giving automatically deducted from your checking or savings account. Complete instructions are in the download. Download automated bank debit form HERE. You can give cash, checks, or by debit/credit card using the giving envelope while attending any worship service at RockPoint. Appreciated Marketable Securities are a great way to maximize your giving, because you receive an immediate income tax deduction for the full fair market value of your securities. In addition, you pay no capital gains tax on the difference between your cost and the fair market value. For more information on giving stocks/bonds/securities to RockPoint, email giving@gotorockpoint.com. Your information is held securely by the Breeze Church Management System. This information will remain private and will never be given away to third parties, other than to process your scheduled contributions. You can schedule new contributions at any time and can modify or cancel those contributions at any time prior to the date they are scheduled. Once the contribution has been processed, however, it cannot be cancelled. If you have any problems or questions related to this, please contact us at giving@gotorockpoint.com.